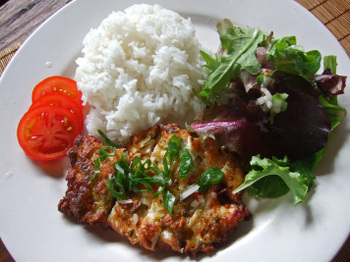 Thai Style Chicken Cutlets - And how tastes change over time - mmm-yoso!!! I remember when I was little, call it "small kid time" as many of my friends would say. We didn't have much(and many times no) money, barely enough for survival. So eating out was a real treat; just having Chinese take-out was a something saved for Birthdays, and other "special" occasions. One of my favorite memories was splurging for the fried chicken from the now defunct Woolworth's(aka F.W. Woolworth's). It may have just been a thigh or drumstick, but when you bit into that wonderfully juicy chicken, it was like you've just had your own little piece of heaven. Woolworth's you may ask....I know it sounds strange, but I faintly remember something along the lines of "You do the pickin' when you buy chicken at Woolworth's"? Of course time marches on, and Woolworth's became sort of an after thought....until I heard that Woolworth's was closing down, at which time I marched myself down to Woolworth's to grab that one last piece, and it was terrible, icky, tasting like that Banquet frozen stuff you reheat. Which made me wonder, had the food quality and recipe deteriorated so much over the years, or had my tastes and preferences changed? I think it was probably a little of both. I had sort of the same dilemma a few years back, albeit not to the same extent when I tried the Chicken Alice recipe. As with all things...time and taste move on. So what does this have to do with some Asian fusion-ny chicken cutlets? More than a few years ago, there was a series on the Discovery Channel called Great Chef's of the World which I used to make a point to watch every chance I had. I really enjoyed that series, and I guess it's still shown....but I haven't run into it in a few years. One of the fun parts was watching all the "local" chefs from Hawaii, like Alan Wong, Roy Yamaguchi, et al cooking up some really interesting stuff. During one segment I saw this recipe, it was called Crispy Thai-style Chicken, and seemed like something even I could pull off, which I managed to do pretty successfully. For some reason, I hadn't made this since we moved to San Diego, now almost 7 years ago. So when the recipe recently reared it's head in the mass of confusion called my Grey matter, I thought it would be an interesting study of just how much our tastes have changed. As I started making the marinade, I noticed something right away.....it smelled really mild, so I decided to use a whole bulb of garlic, and double up the amount of fish sauce. The dressing needed a bit more zip so I added some chopped onions. 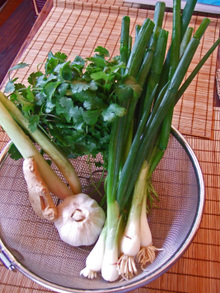 - Combine marinade ingredients in a large bowl. Mix well. 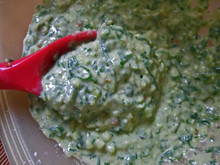 - Combine dressing items, and mix until sugar is dissolved. 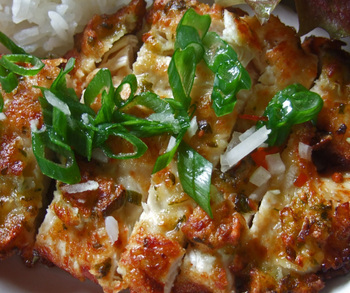 - Remove chicken from oil, drain, plate, and drizzle a few tablespoons(or more) over chicken. Use the remainder as a dressing for a green salad. Since a good friend of mine has called my mind a "cesspool of useless information" here's another one for you...."don't cook tonight, call Chicken Delight!!!" OMG Woolworths! What a blast from the past. They had the best chicken and I really enjoyed their local style inari and maki sushi. Even though they no longer exist, you made me so home sick just then, it kinda hurt just a little. More for a longing of a bygone day than anything else. I'm not much of a cook myself, but your recipe sure makes me what to try. Just in case I haven't told you, I really appreciate your blog. Great post! My tastes have changed dramatically over the years, but part of me still appreciates the food from long ago because it's a part of what makes me who I am. Sure, it tastes bland, processed or greasy now but in my memories it will always be five stars. Great post. This reminded me of when we first came over and the restaurant inside of K-Mart was a big deal for dining out. Man, I haven't thought of that in years! Woolworth's had the best fried chicken breast. Woolworth's in Waikiki was right on Kalakaua Ave., the main street in Waikiki. They even had a full restaurant. Oh, my. Woolworth's definitely a blast from the past. I don't remember trying their chicken though. Your chicken looks ono! That looks simple and good! Mr. Tall and I will definitely try it some day. Hi WC - I guess it's the Nuoc Mam Cham being referred to. Thanks for the Lemongrass Chicken recipe. Hi Keoki - Funny thing, I even recall Woolworth's having good roast beef for some reason. Hi RONW - I remember the thick foiled lined packages the chicken was put in....kept them warm for hours! Hi Kat - Oh my....their fried chicken was really good. Hi LMCC - It is a simple recipe. If you make it, let me know how it turns out. OMG! Woolworth's in Waikiki had the best fried chicken. We didn't have it often but it certainly was a treat when we did. My tastes have changed in leaps and bounds! These chicken cutlets are right up my alley as well. I have some chicken in the freezer I was wondering what to do with, and now I know. Hi Carol - Same here.......it was a treat. That was my favourite chicken at Woolworths - in Buffalo, NY - my family used to go and visit my aunt in Buffalo - she would take us to Woolworths for lunch - the chicken i can still remember the line up buffet style - pick what you want - and the cheesecake was heaven - I would love to get that recipe! I would sell it at my wingshop! Why can't someone bring that flavour back ?? The story does not have to stop. Let it continue! I WM - I'm hoping someone will be able to help......It was some really great chicken. So after stumbling upon this blog for the first time, I thought I would give this recipe a try. Unfortunately, I don't think the recipe is complete. 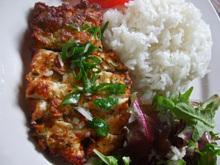 The marinade has no liquid listed to achieve the same consistency the picture shows. 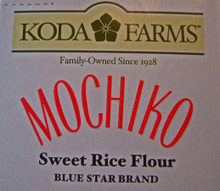 Also, it does not state how much Mochiko should be added to the marinade. If you could modify the recipe I would love to give this a try and give you some feedback. Hi ef8mugen - The recipe is complete - fish sauce and egg whites are the liquid components. Good luck!